My 4-year-old son hasn’t yet stopped “making the apple come up” on our copy of Matthew Silverman’s new book, whose cover features a sliding Home Run Apple turning framed photos of Seaver, Kranepool, Stengel and Kingman into portraits of Gooden, Hernandez, Piazza and Wright. So if you’re the kind of person who judges a book by its cover, then by all means go out today and get yourself a copy of New York Mets: 50 Amazing Seasons. That the inside of this book is even better is still a secret to my boy, but one I hope will reveal itself to him over many summers to come. In perusing this book, a comprehensive, heavily illustrated, factoid-laden, coffee-table team history, I was reminded of my own youth and Donald Konig’s hardcover commemorating the Mets’ 25th anniversary. I received that book as a Christmas gift in 1986, and if you asked me then I’d have told you it was as solid a team history and as valuable a keepsake as existed in all of Metland. I can tell you today that without minimizing the hours of discovery and pleasure Honig’s book provided, Silverman’s history is not only twice as long but many times better as a story, chronicle and archive. Silverman, who you might recall as a co-author of the Mets by the Numbers book, is a swell and generous guy and an animal when it comes to writing about the Mets. I don’t know how he does it, but this book is distinct from the half-dozen other Mets projects he’s tackled including MBTN,Mets Essential, 100 Things Mets Fans Need to Know and Do Before they Die, Total Mets, Tartar Control Mets and Raspberry Mets. I may have made a few of those up but wouldn’t be surprised to learn he’s working on them. This book is simply divided into five chapters, one for each decade of Metsdom, and has a picture or four on every page — good photos, and not just the mugshots populating Honig’s Quarter-century tome. Photos include memorabilia ranging from scorecard covers to buttons to ticket stubs to beer coasters. It all says Mets in one way or another. Silverman’s a good writer. He’s economical and deft with transitions, helping 50 seasons (many themselves forgettable) breeze by cohesively. Mountains of sidebars liven it up, some offering summaries, others key boxscores. Brief bios of the Top 50 Mets (Al Weis? Really?) are peppered throughout. These Top 50 bios include images created so as to recall a mashup of Topps baseball cards of 1973 and 1974, and while I like that idea I don’t much like the execution. That’s a small complaint in an otherwise very satisfying team history that kids big and little will surely treasure. Submitted by gored82 on Mon, 03/28/2011 – 8:05am. Not to split hairs, but it looks like Gooden, Piazza, Reyes, and Strawberry on the cover. Where’s the apple, Seaver, Kranepool, Stengel, et al? Submitted by Jon Springer on Mon, 03/28/2011 – 8:13am. I shoulda mentioned it: The image of the book, which I found on the website of its publisher, is not the final version in its published form. This I discovered is a fairly common screwup in the book world, since the deadlines for getting images online in advance of the publish date at sites like Amazon are often well ahead of the actual art deadline for the physical product. 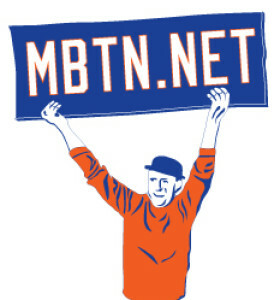 If you go search BN.com for ‘Mets by the Numbers’ it returns a version of the cover we later junked as well. At least it used to. Anyway, the cover you see there resembles what the actual book looks like with the Apple up (the apple is like a “pull tab” at the top of the book, also not pictured). The four frames have blue backgrounds and photos of the earlier 4 horsemen when it’s down. Submitted by gored82 on Mon, 03/28/2011 – 10:24am. They have the same image on amazon.com, from which I ordered the book.